California can cut its wasteful use of water by 20 percent in the next 25 years while satisfying a growing population, maintaining a healthy agricultural sector, and supporting a vibrant economy. That’s the central message of “California Water 2030: An Efficient Future,” (PDF) a new report by the Pacific Institute of Oakland, California. The analysis, which provides a sharp contrast to the California Department of Water Resources 2005 Draft California Water Plan, details how smart technology, strong management, and appropriate rates and incentives can allow the state to meet its needs well into the future with less water. “California Water 2030” describes in detail a “high efficiency” scenario for the state that will cut wasteful water use by 20 percent without harming the economy or our quality of life. And the benefits to this approach are many: Improving the efficiency of urban and agricultural users could help ameliorate the substantial stress California places on its rivers, groundwater aquifers, and wetlands while improving opportunities for business and recreation. years (see graphs, next page). And in-depth research by the Pacific Institute (see “Waste Not, Want Not”) shows that improving efficiency by 20 or even 30 percent is well within California’s grasp – if the state can break free from its business-as-usual approach to water. 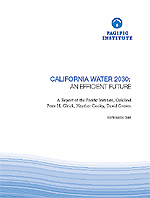 Download “California Water 2030: An Efficient Future” (PDF).